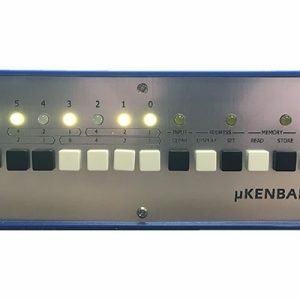 View cart “µKenbak-1” has been added to your cart. The project case is now laser cut for much easier assembly! Also included is a spiral-bound, full color assembly manual. This is a beginner to intermediate kit for people with experience soldering. It can be built in approximately 4-5 hours. Please read the Build Instructions to familiarize yourself with the construction of the kit, and don’t be afraid to email me with questions. By default his kit includes a 9 volt power adapter made to connect to a Type A electrical socket (used in the USA, Canada, Mexico & Japan). You can choose to receive a 9 volt EU power adapter. If you want to use another power adapter, make sure it has a 5.5×2.1mm plug and provides 9v-12v at 1 amp. You can also power the Altair-Duino from a USB port. *Please note: due to licensing issues the Bluetooth module will not connect to iOS devices (iPhone, iPad, iPod) but will connect to Mac and Windows computers. Very easy to build as long as you pay attention to the instructions and advice. Nothing beats the pictures to verify what you’re reading. That was a good tip to install the LEDs last using the panel to align. I suggest the same panel alignment technique with the switches before they are soldered or you will be unsoldering and moving them. I know, I broke one. The PCB design is very clean with minimal jumpers. Definitely fun to take control the computer using switches like the old days. I was able to quickly build the kit and had it working in a matter of a few hours. Well documented and well put together. Amazing kit. Had a bit of trouble with the header pins as outlined in the instructions, but i was able to overcome that with thinner rosin solder and a finer tip. 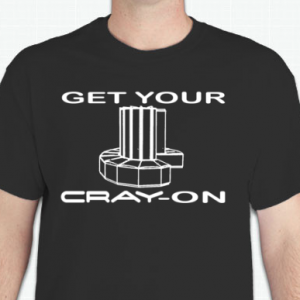 The kit creator has great response time, is extremely helpful, and shipping time was rather fast! Easy to build kit, well documented apart from the audio connector is not mentioned ! Led’s are too bright probably change the 150ohm resistor for 220 or 270 ? I took your advice (and the advice of many others) and have replaced the 150 ohm resistors in the kit with 1k resistors. It has a much more pleasing look now. L1: It’s beautiful! Even the circuit board is nice to look at. It’s truly a work of art. L2: It’s fun to put together. It reminds me of the old Heathkit kits. L3: Some extra resistors, LEDs, and standoffs were provided. L4: It’s not powered by a Raspberry Pi, which would seem like cheating compared to an Arduino. D1: The LEDs are far too bright, especially in dim light. D2: Don’t run your fingers along the bamboo frame or you will get splinters. D3: You can’t easily access the SD card after completing the kit. D4: The 12V power supply seems unnecessary when it works with only 5V connected to the programming port. Can anyone suggest a panel mount micro-USB or USB-B female port for the round hole in the MAX3232 rear panel? The electronics are a piece of cake. It’s all nice, easy through-hole work with generous spacing. Just make sure you’ve got a Helping Hands or other means of holding the board at an angle, as you probably won’t want to let it rest directly on the components while you’re working. I had a little trouble with the mechanical aspects, e.g. getting all the screw holes and the front panel to line up, but I’m pretty awful at carpentry, so my results may not be typical. In the end, it turned out looking very good, even in spite of my fudging and trimming to get everything aligned. Took me about 4-5 hours in total, but everything worked first try, and I was able to boot up CP/M and play around with Ladder via Putty! Tip: if you’re installing the rear panel, solder the power and audio leads BEFORE mounting the panel in place. The rear of the project enclosure is laser cut now, so no more “woodwork” is required! Building an Altair has been a life long dream of mine. 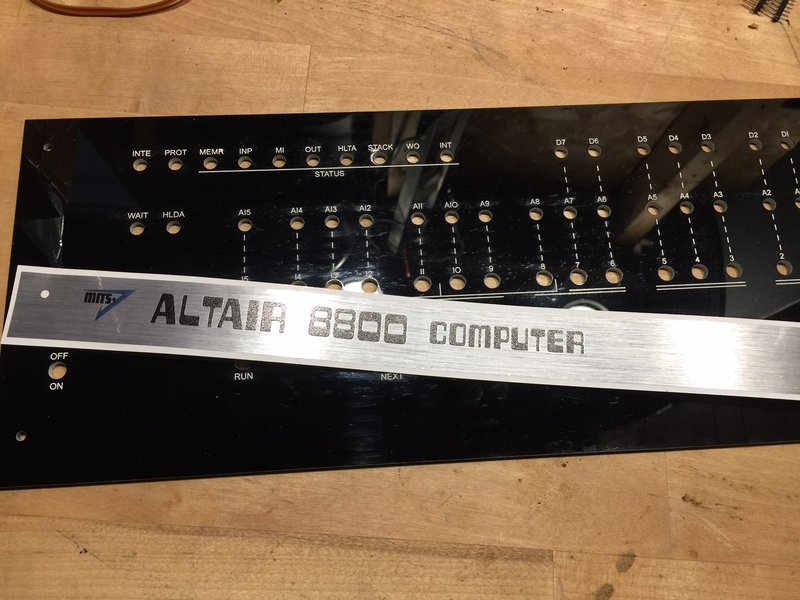 As a collector of computer systems, the Altair has always eluded me. Thankfully, this kit was simple, lovingly crafted, well packaged, and a step by step instructions with photos are very logical. Chris Davis has not only provided the look and feel of an Altair, but has also included every scrap of software he could find. It’s very simple to mount and boot a disk from an impressive collection. This is the kind of the kit and software I’ve been looking for! Great job creating this kit! I just finished the 1.4 version of the kit with the new 1k resistors, and the serial port option. The fit and finish of the kit is great and the PCB was clearly labeled, with good through-hole solder points. I soldered all the components over a weekend, and then put my attention on painting the bamboo case. Like others, I went with the Rust-Olium satin finish in Oasis Blue from Home Depot. It’s a hair lighter shade than the blue on my other Altair clone, but it turned out great and looks very authentic. 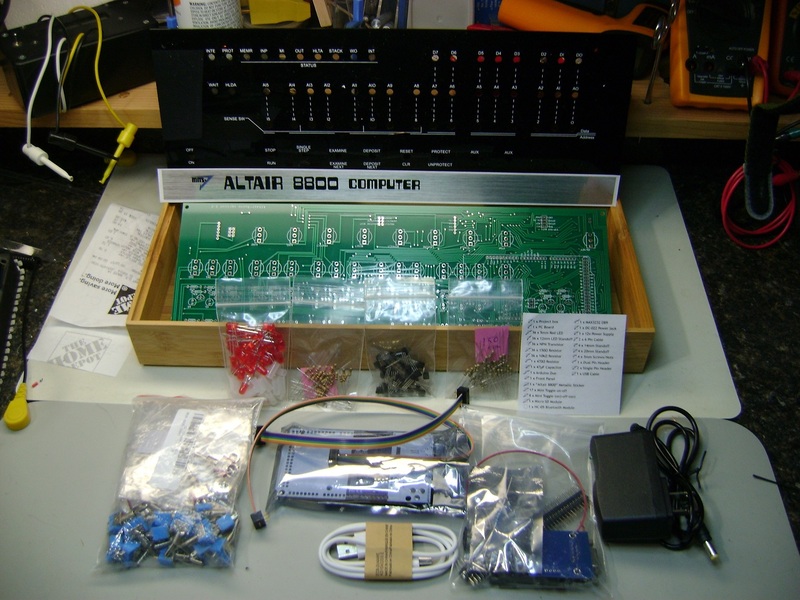 I used to be a bench tech (in the 80’s) so I’ve had some solder experience, but I think anyone with a good soldering iron and some patience will have no problem building this kit. I’ve tested everything except the DB9 serial port; sadly I can’t find a cable in my garage, so I’ll have purchase one. Bluetooth and USB serial work fine for now. The kit looks nice next to my PiDP-8/I. If anyone’s looking for another kit to build, then checkout Oscar’s PiDP-8/I at Obsolescence Guaranteed. It’s another fun kit at about the same experience level. The PDP-8 is about a decade older than the Altair. 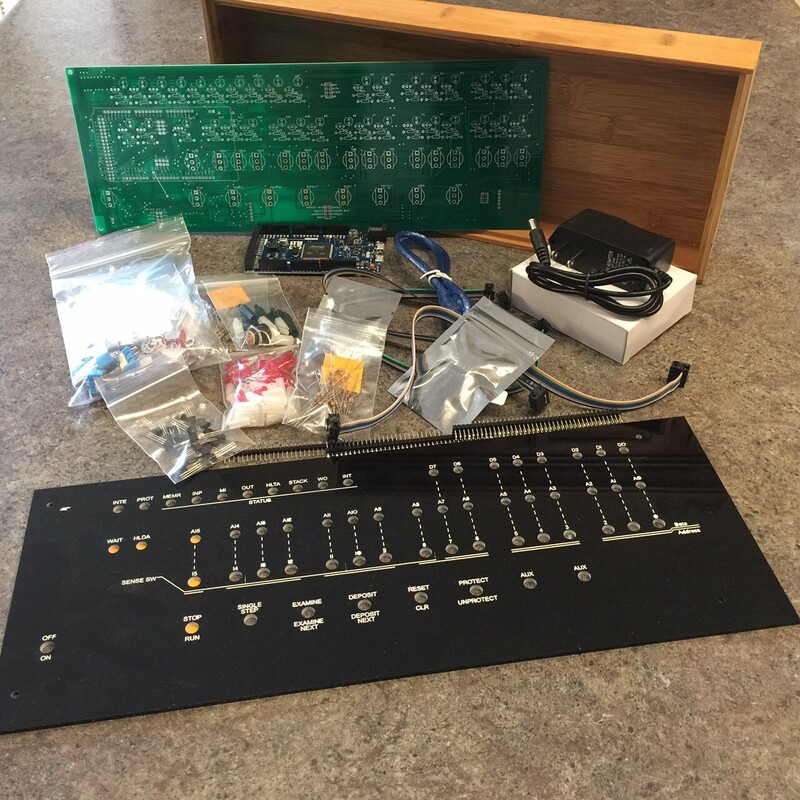 Oscar has also just produced a PDP-11 kit, so old folks like me can go all the way back to our UNIX days, before Linux and GNU. I love the kit! I bought mine a the Vintage Computer Festival West, and assembled it the next evening in about three hours (I’ve done quite a bit of this type of work, so it went smoothly). The instructions are great, and the kit worked first time when I powered it up (with the exception of one mysterious issue that Frank P. is helping me with…). The completed kit looks great, and with the laser-cut box goes together very smoothly. It’s easy to see the refinements in the assembly process which must have come from investing the necessary time to assemble a buch of these during beta testing – there were no surprises, and everything fit together perfectly. It’s earned a permanent spot on my desk, where it’s happily flashing away right now. And I must say, the price is *very* reasonable for a kit of this quality! Reminds of the days I used to do Heathkits. Documentation was great and the entire kit was very easy to put together. I’m having fun rediscovering computers with just basic hardware and fundamentals (my first computer was a Commodore VIC 20), it’s a nice break from todays technology. It makes you appreciate have far we come in a relatively short period of time. 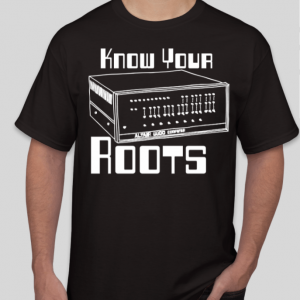 Keep up the good work and I look forward to some of the other kits (Apple 1 especially) you are thinking of doing. Nice to see someone took the time to create such a well-crafted kit – look forward to your having them in stock again. At age 81, my eyes are a bit worse than when I built my original Altair (Mar, 1975), but I successfully built the duino! Only issue was a solder bridge on the DUE socket that kept SW 11 always on. Took a while to find it, but finally did it. Lots of fun and really brings back memories. Had one bad switch, and I had used it in the on/off position. Chris quickly replied with not one but 2 switches – less than 4 day turn-around.